Project obstacles and solutions: The Bluffton Harrison School Board voted to replace their high school's football grass field with a new artificial turf field during the summer of 2011. 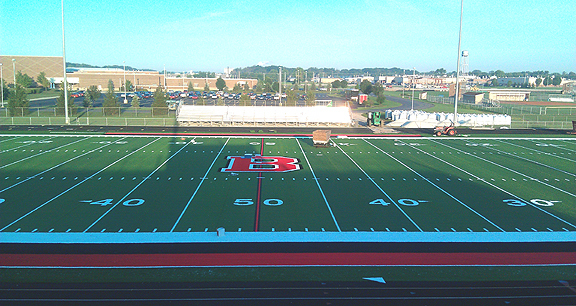 Complete Turf Surface was hired to install the turf. John Brickley Excavating and Fowler & Sons Excavating were hired to tear out the old field and do the sub-grade work. The plan required a herringbone drain system that was to be covered with compacted aggregates to provide quick drainage of rainwater through the turf. This was to be covered with smaller aggregates to provide a solid footing for the turf. The tolerances on the grade of the sub-turf aggregates could not be more than 1/8 inch to ensure the turf would not tear or create holes. John Brickley contacted IMI Bluffton to supply the aggregates for this project. IMI had previously supplied aggregates for turf fields at Delta High School, Noblesville High School, Fishers High School, Hamilton Southeastern High School, and three fields at Ball State University. IMI Bluffton supplied 4,000 tons of No. 8 limestone for the subsurface drain work. When compacted, this created enough void space to allow water to quickly flow through to the drain system. For the sub-turf aggregates, IMI technicians suggested using No. 11FF limestone. Its angular composition locks it into place better than rounded gravels when it is compacted. This proved to be a critical to the construction process. Since the kickoff for the first home football game was August 26 and the first shovel of dirt was turned on June 24, there was no time for delays. Using the No. 11FF stone made the grading of the field go quickly and kept the turf installation on schedule without incident.